Nearly four decades have passed since Terry Fox embarked on his final Marathon of Hope but his legacy continues to live on in the annual Terry Fox Run. Right here in Orangeville, dozens of local residents will come together on Sunday, Sept. 16 to participate in the community’s Terry Fox Run. Every year, as summer prepares to fade away into fall the country unites as one to commemorate one of Canada’s favourite sons. 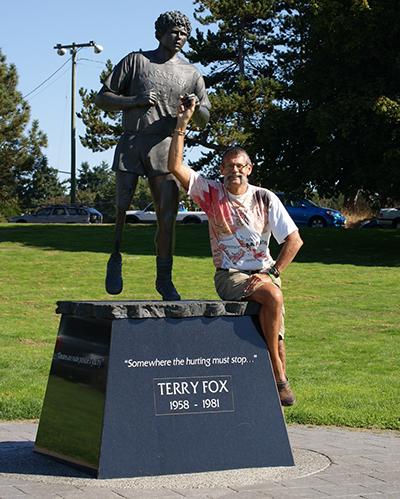 Terry Fox is widely regarded as a Canadian hero for his selflessness in launching his cross-country Marathon of Hope tour in 1980. The catalyst for the tour came three years prior, when Terry was recovering in hospital after having his right leg amputated just above the knee following a brief battle with bone cancer. He watched as countless patients suffered with various forms of cancer and decided to do something to raise awareness and money for cancer research. With little fanfare at the time, Terry started his journey in St. John’s, Newfoundland & Labrador. Over the ensuing months, he ran the equivalent of a marathon a day – covering a distance of 5,373 kilometres over 143 days. While he hoped to make it all the way to Victoria, British Columbia, cancer once again reared its ugly head, causing Terry to half his efforts just outside Thunder Bay on Sept. 1, 1980. He was just 22 when the disease took his life on June 28, 1981. Terry’s efforts captured the imagination of millions, including Orangeville resident Mark Whitcombe. He remembers the day Terry travelled through Toronto, greeted by a crowd of more than 10,000 people at Nathan Phillips Square. Although he wasn’t in attendance, Mr. Whitcombe says the feeling generated that day lay the foundation for what would eventually become the annual Terry Fox Run. A participant himself for several years, Mark took on a leadership role in organizing the local Terry Fox Run back in 2007, filling a position vacated by Greg Verner, who had previously led volunteering efforts for more than 25 years. Having been diagnosed with a non-aggressive form of prostate cancer several years ago, Mr. Whitcombe says the Terry Fox Run has taken on even more meaning for him. Even though he has since handed off organizational duties to a new team, predominantly led by Shannon McGinnis and Julie Koch, he’ll always have a soft spot for the annual fall spectacle. The Terry Fox Run has been a part of David Kirk’s life now for 38 years. While he admits he didn’t really focus much on the community aspect of the event in his earlier years, David has more than made up for that since, estimating his overall fundraising total to be more than $51,000. He hopes to tag another $3,800 onto that total following this year’s run. A retired school teacher and principal, Mr. Kirk credits the Terry Fox Runs that take place annually in schools across the county with igniting his interest in the event from a fundraising standpoint. “Helping to lead those school events allowed me to learn more about the man I had seen on television, and read about in newspapers. He’s probably one of the greatest Canadians ever and I really, really got caught up in the efforts of this young man. His message, stating that if he couldn’t continue, then others had to continue for him… I’ve taken that as a personal challenge and mandate over the years,” Mr. Kirk told the Citizen. When asked what his favourite memories are of the event, David recalled the time he participated in a Terry Fox event in Victoria, B.C. He was in the city to watch one of his sons compete in the Mann Cup, but didn’t want to miss out on the one event he looks forward to more than most year after year. While in Victoria, he had the opportunity to meet one of Terry Fox’s cousins, while also raising his highest-ever single-event total, bringing in just over $4,300. “That was rather special,” David remarked. As he looks forward to this year’s event, which will see him walking with his family, Mr. Kirk has thrown down the gauntlet to the local community, challenging residents to step it up this year and raise what would be a record-breaking total in Orangeville. The local run will take place on Sept. 16 at Island Lake Conservation Area. Registration opens at 8:30 a.m., with an open start slated for between 9 a.m. to 1 p.m. Distances of 5 and 10 kilometres will be available, while routes will be accessible to bicycles, unicycles, strollers, rollerblades and wheelchairs. For more information, visit www.terryfox.ca. To donate, visit David’s fundraising page at www.terryfox.ca/kirky.